Tsar Peter of Russia had a well-known impact on St. Petersburg, Russia, the city that bears his name. What is less well-known is the flow-on influence he had on Helsinki. Tsar Peter had been dead for more than a hundred years by the time construction began on Helsinki’s famed Lutheran Cathedral. But the architectural stamp his leadership put on St. Petersburg continued on when Finland was held by Russia as a Grand Duchy in the early years of the 19th century. 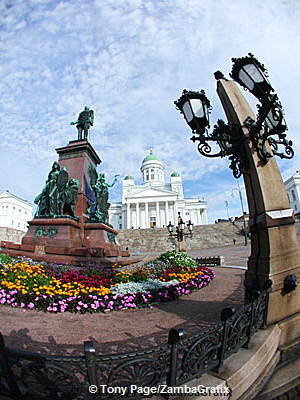 Much of Helsinki’s architecture has its beginnings in St. Petersburg. Nowhere is this more evident than in the design of Tuomiokirkko. The church was originally built as a tribute to the Grand Duke, Nicholas I, the Tsar of Russia. One of the most prominent symbols of Helsinki, the Lutheran church in Senate Square known in Finnish as Tuomiokirkko should be on every tourists must-see list. Its Neo-classical edifice, Corinthian columns and Classical dome are the very prototype of many buildings across the world. 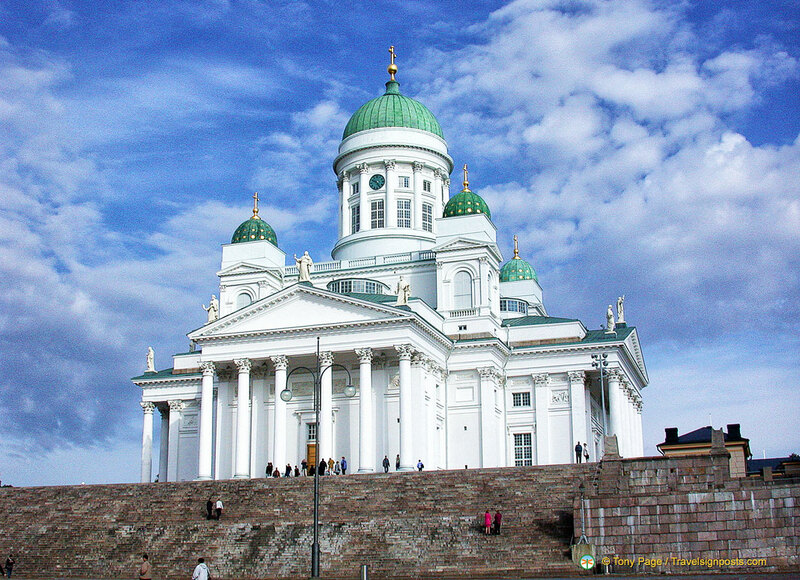 A functioning church, whose Lutheran members comprise 83% of Helsinki’s population, it is also one of the most popular Helsinki attractions for tourists. Over 350,000 come to visit it every year. Set high atop a hill in Senate Square, it was begun in 1830 by the German architect Carl Engel, one of many German artisans imported during the 19th century. But the original design saw substantial modifications by the time of the church’s completion in 1852 by Ernst Lohmann. Engel died in 1840. Not least of these changes to the cathedral architecture were the addition of two bell towers, four small domes and a series of 12 statues of the Apostles on the roof. The belfry in one of the towers makes for an excellent short side-excursion when viewing the interior. A chapel resides in the other. The green domes lend a beautiful cap to the white Greek-style facade. The effect is all the better for being at the peak of a small hill in the city. That hill is surmounted by fifty brown brick steps that lend not only a great view but a wonderful color base for the building. At the base of the steps is a monument that is alone worth the trip. A statue of Tsar Alexander II stands atop a large rectangular stone base, surrounded by several statuary standing on their own brown stone elevation. Interestingly, Alexander is not seated on a horse, making the effect decidedly different from many other monuments. The interior has been extensively renovated in recent years, making it well worth seeing too. Seating 1,300, there is an impressive altarpiece that was painted in the 1880s. Aside that are angel statues and a pulpit. But the part that received the most renovation, and the most interesting aspect of the interior, is the Crypt. This low-lit resting place provides a peaceful, yet eerie sight. That is in stark contrast to the austere, bright white décor of the rest of the cathedral’s interior, making for interesting viewing. The Cathedral is used for major state and university functions and the Crypt is a venue for concerts and exhibitions. The church is open to visitors daily (09:00 – 18:00), except when there is an event on. Sunday service is at 10:00.